A new report released by World Animal Protection reveals thousands of captive elephants across six Asian countries are suffering in inhumane conditions to support elephant rides and shows for tourists. Entitled “Taken for a Ride,” the report investigated 220 tourist venues across Thailand, Sri Lanka, Nepal, India, Laos and Cambodia and found that 77% of the nearly 3,000 elephants surveyed are suffering. When not giving rides or performing, elephants are typically kept on short chains, fed poor diets, given limited veterinary care and are frequently kept on concrete floors in busy and stressful locations. 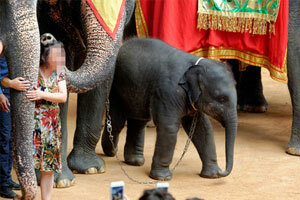 Thailand is the main concern using twice as many elephants in tourism than all the other Asian countries combined. Tourism to Thailand doubled from 15.9 million to 32.6 million visitors between 2010 and 2016, contributing to a 30% rise (1,688 to 2,198) in elephants held in captivity for tourist activities. Despite the rise in captive elephants used in tourism, a 2017 poll shows a significant drop of 9% (to 44%) in the number of people who find elephant riding acceptable compared to just three years ago. The research shows that more than 80% of tourists would prefer to see elephants in their natural environment and Canadians are no different (81%). And many travel companies agree with World Animal Protection that the best place to see an elephant is in the wild or at a genuine elephant sanctuary. More than 160 global travel companies have agreed to no longer offer visits to venues with elephant rides and shows in any of their markets. Among these are popular global brands including G Adventures, Intrepid, TUI, the Travel Corporation (including Contiki and Trafalgar) and World Expeditions. And in 2016, TripAdvisor said it would stop selling tickets to experiences where tourist have direct physical contact with captive wild animals or endangered species. Go to http://www.worldanimalprotection.ca for more.